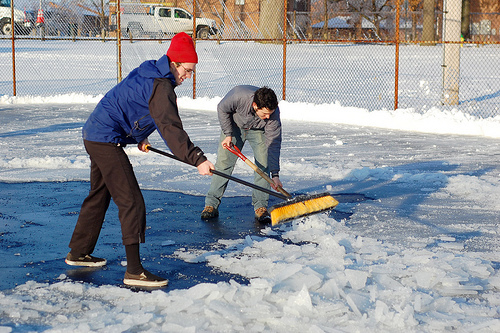 Pickup games are played regularly twice a week, sun or snow. Bike polo is not a seasonal sport. Here is the Google calendar for the courts and scheduled times for polo, hockey, and soccer. If you’ve never experienced bike polo, you don’t know what you’re missing! We encourage everyone to come hang out at the courts with us and jump in on a game. We guarantee you’ll be hooked! No experience necessary except knowing how to ride a bike. Bikes and mallets are available to borrow if you want to try one of the fastest growing sports played all over the world! If it snows, bring your mallet and a shovel!